Pride. A word of many denotations. Merriam-Webster cites three (four, if you count a pack of lions as one definition). Though a negative light oft gleams over its place in the dictionary, a swell of pride in oneself cements feelings of self-worth, something from which a good many of us can benefit. Myself included. Pride is ennobling. In lethal quantities it can rob some people of the inate awareness that the right to humanity is shared by all who claim the Homo Sapiens nomenclature. But in healthy doses, prescribed by the correct doctors of life – parents, friends, colleagues, romantic partners, what have you – pride reinforces our interpretations of our individual value. Pride pushes us to succeed. Motivates us to scrawl the final sentence on a senior thesis. Swipe dust bunnies from the nightstand. We know when the mundane tasks which make us roll our eyes into our skulls are done, we’ll feel not only clearer in the head but proud that we plucked our limbs from the couch before they atrophied completely. The tidal wave of pride procured from helping others, though, is the gladdest of all. Like distributing presents at Christmas. Receiving is enriching, invaluable – but giving is another chemical in the human element. Knowing I’ve picked a piece of my soul like a row of wildflowers and handed it pure and bare to another person, and they placed it in a vase of their own and water it daily with constant appreciation, keeps me from shriveling into bitterness. Giving is water and wine. It hydrates a parched heart. Feeds a growling stomach. And it ends in a glow of pride that nestles in my heart and snoozes with a silly grin on its face. The kind of pride that laces my shoes on mornings of torrential deluges and pulls my legs into a walk when the rest of me stagnates and longs for a deep dark sleep. Definition three from Webster: A feeling of happiness that you get when you or someone you know does something good. I’m open about my struggles on my blog, because silence is a devil with a trident when it comes to mental health anomalies. My conditions catalyze an exhausting torrent of self image devaluation which clings in any temporal span of minutes to months. A few days past I helped my friend tentatively reconfigure her college plan for the spring and beyond. A whoosh of tension slipped from her shoulders and out of the Starbucks door. I watched it go and in flew a cautious little bird called optimism. Somehow her relief became my relief, but for a different reason. When I give and it is accepted, I am proud. When I am proud, I can accept my crooked nose and my quirky laugh and the fact that I am not a hobbit in the Shire but a human being with legitimate fights and who fights them damn well even when they successfully fog my mind for awhile. In these moments of satisfaction with my existence, I forgive myself for little and big things. From burning my finger just now whilst removing a grilled cheese sandwich from the stove to that rude thing I said about my now-married friend a few years ago. Pride is not always akin to conceit or hyperinflated holier-than-thou sentiments. It is most powerful and beautiful at its gentlest. Have pride in your nuances, the threads which knit and stitch your organs and your skin. 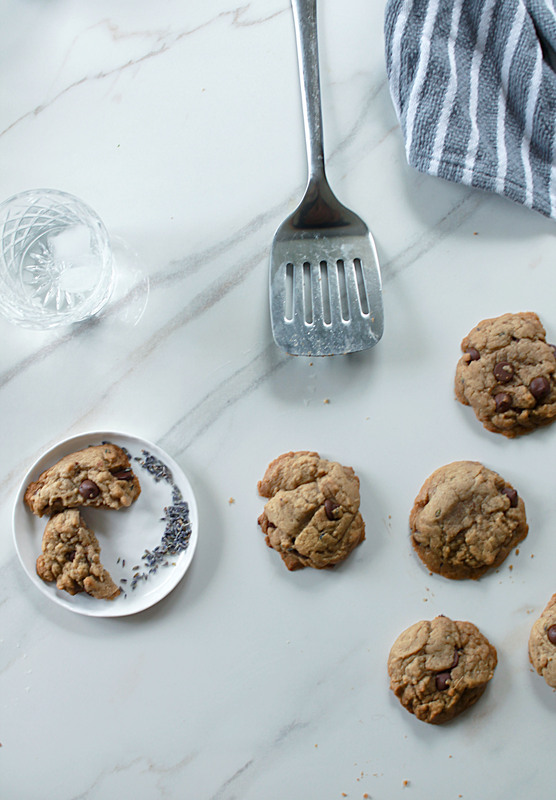 Celebrate this newfound joy with a batch of lavender and dark chocolate chip cookies. Lavender is refreshingly mild on the nose and tingles like mint on the tongue, a perfect cooling agent for steamy Floridian evenings. 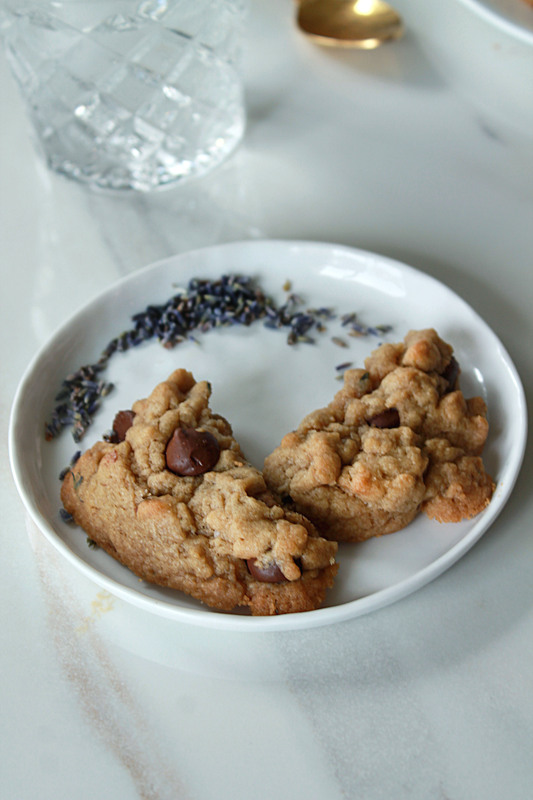 Cookie dough is the perfect vessel for housing lavender and chocolate together. A humming domestic harmony. Take a few outside, lie under the stars on a satin blanket and close your eyes. The world is rotating and you are alive enough to taste the sweet little victories birthed from being on this earth. Take pride in that. Thank you to Marcella Dilonardo for featuring my recipe for Salted Chocolate Doughnuts & Orange Earl Grey Buttercream on FeedFeed’s Sweet & Salty feed! 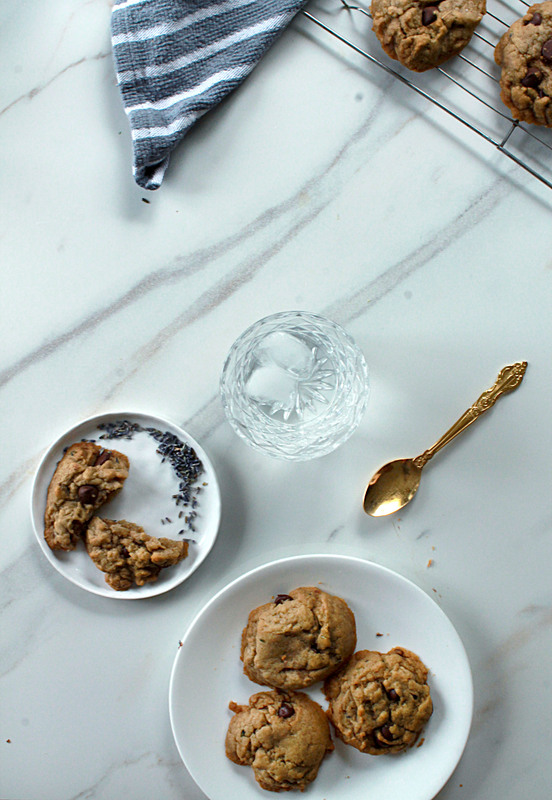 Check out Marce on her blog, my original recipe, and the entire beautifully curated gallery for further nom-spiration. 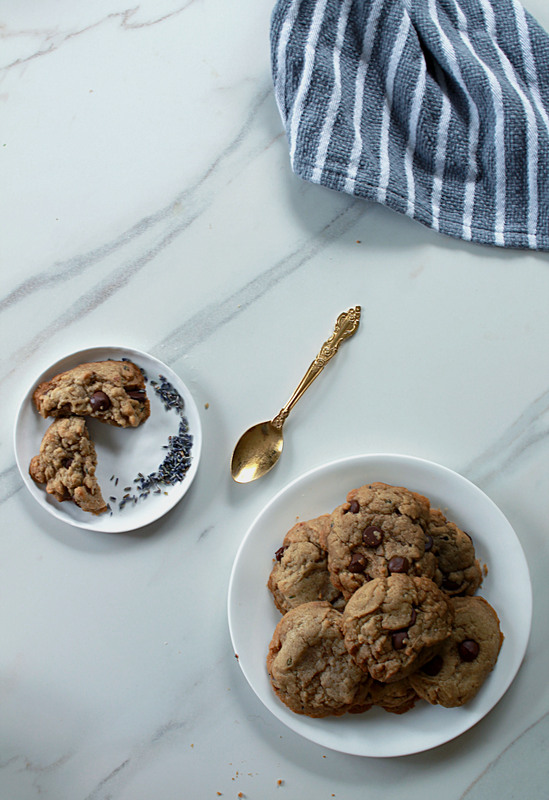 These cookies are visibly oily: this is not abnormal when dealing with coconut oil, and so long as enough flour is used the finished cookie will not drip even though the dough might. 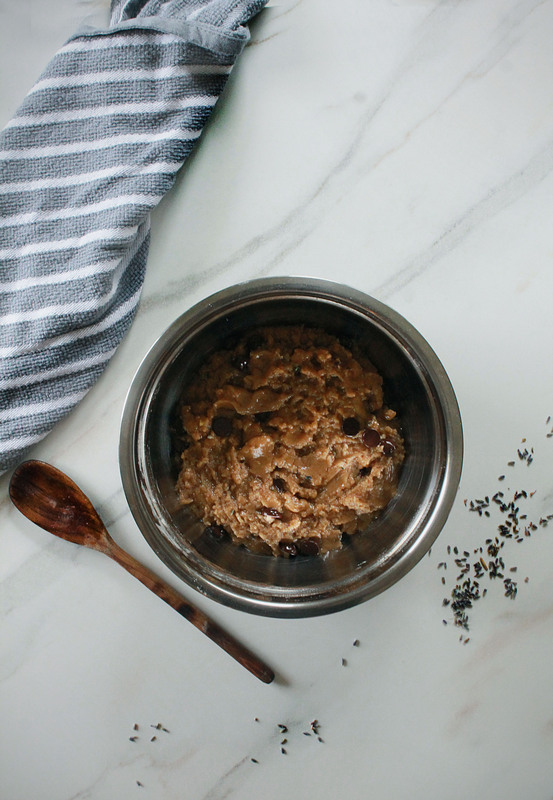 The coconut oil adds an airy essence to a cookie already freshened and flavored by crushed dried lavender and bold dark chocolate chunks. 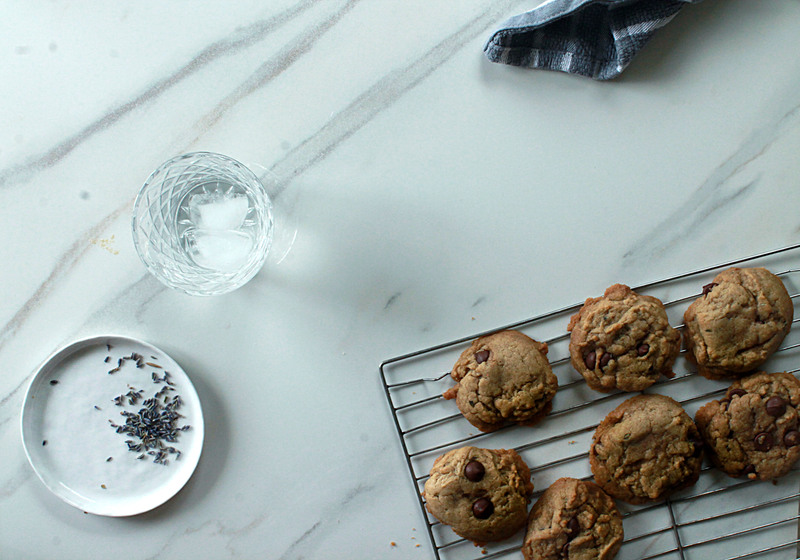 Assembly: Grease a cookie sheet or cover with parchment paper. In a medium-sized bowl, combine oil and sugars. Add vanilla extract; whisk in eggs. 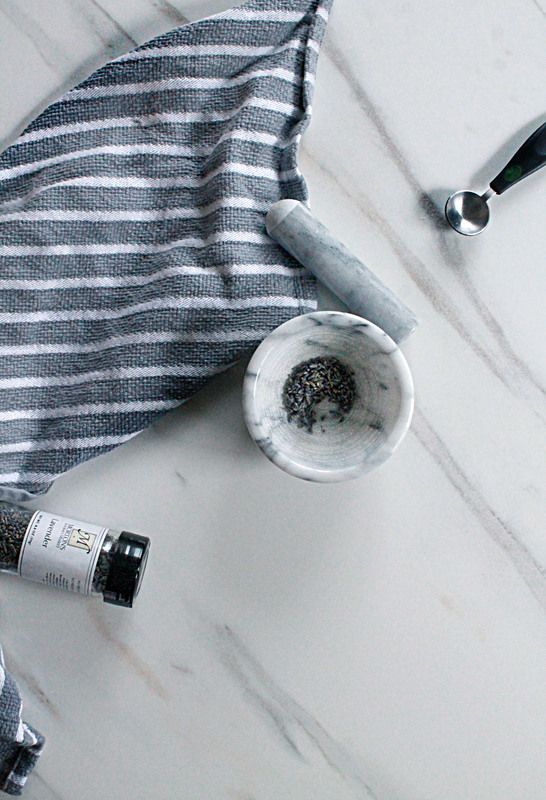 In a separate and smaller bowl, combine baking soda, flour, salt and lavender. Add dry ingredients to wet, stirring until evenly distributed. Fold in chocolate chips. 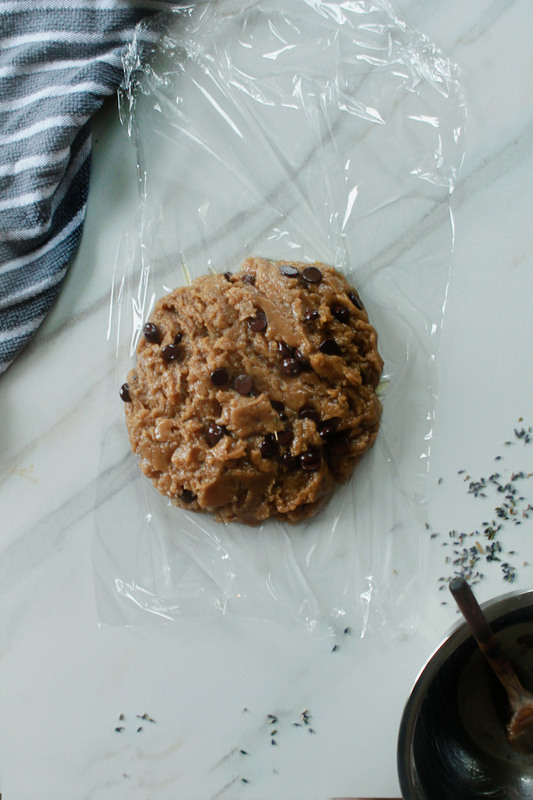 Form into a ball, wrap in plastic wrap, and refrigerate for about an hour. Preheat oven to 350 degrees. 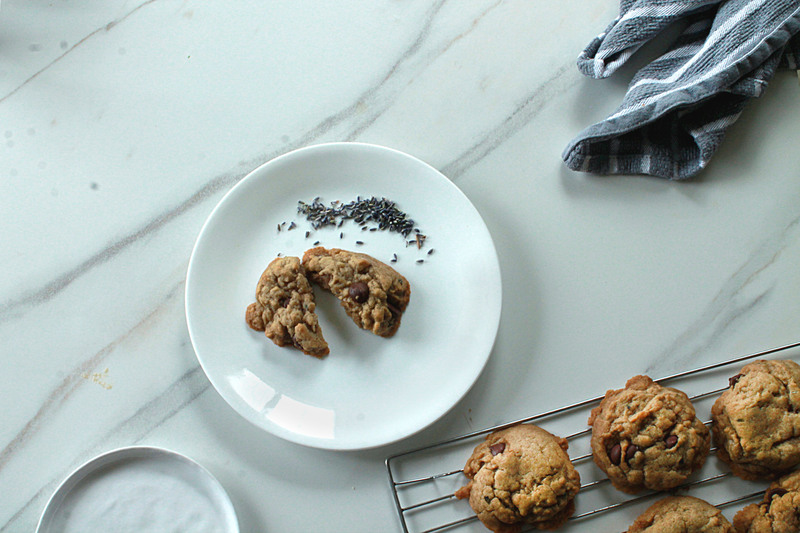 Remove dough from refrigerator and drop by rounded tablespoons onto prepared cookie sheet(s). Bake 10-12 minutes or until bottoms are lightly crisp and golden-brown. Remove and cool for 10 minutes on the pan, then transfer to a metal rack and continue to cool 20-30 more minutes. Sprinkle with extra salt if desired. Store in an airtight container for up to three days, then transfer leftovers to freezer and keep forever (if you’re me) or two-three months (if you’re a normal human being). I’m drooling right now. This sounds absolutely AMAZING!